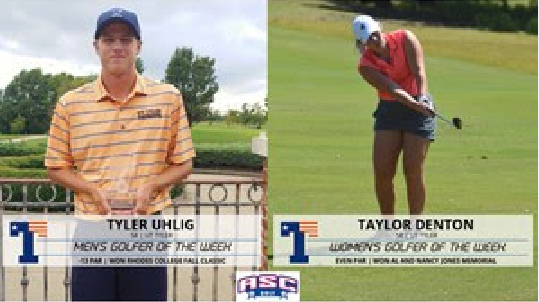 UT Tyler senior Tyler Uhlig (Magnolia, Texas) set a Rhodes College Fall Classic record shooting a -13 par, winning individual medalist honors at the tournament at Tunica National. Uhlig had a 68-66-69=20, helping the Patriots to a second place finish and claim his second career Golfer of the Week award. UT Tyler senior Taylor Denton (Burnett, Texas) fired a 69 to open the Al and Nancy Jones Memorial in Tyler, then shot a 75 for an even-par 144 to win the tournament by five strokes. Denton’s performance helped the Patriots win the tournament and earn her second career Golfer of the Week honors. McMurry junior Brendon Lowrance (Mansfield, Texas) set a War Hawk 54-hole record with a 68-68-71=207 for a -9 at the Rhodes College Fall Classic at Tunica National. Lowrance placed third overall at the tournament. Hardin-Simmons senior Luke Smith (Montgomery, Texas) set a Cowboy Division III era record score with a 66-72-70=208, for a -8 at the Rhodes College Fall Classic and a fourth-place finish. UT Tyler senior Katelyn Hicken (Frisco, Texas) shot a 72-77=149 for a +5 and teammate freshman Zoe Mayfield (Longview, Texas) had a 75-76=151 (+7) to finish second and third, respectively at the Al and Nancy Jones Memorial in Tyler.